Your one-stop source for sea-level information. November 14, 2018 — Most readers here probably know that I am very honored to have been invited to join the CO2 Coalition, an organization of mostly-prominent scientists (plus a few no-names like me! ), dedicated to de-politicizing the public debate surrounding CO2 emissions and climate change, and helping to substitute sound scientific analysis for unscientific climate hysteria. Today I'm pleased to share a letter by Prof. William H. Smith (pdf or ePub), entitled, The Double Bind and Scientific Honesty, in which (among other things) he explains why he, too, is very pleased to be a member of the CO2 Coalition. October 7, 2018 — An audit of global warming data finds it riddled with errors: #Datagate! First ever audit of global temperature data finds freezing tropical islands, boiling towns, boats on land. June 2, 2018 — We got a letter to the editor in the Wall Street Journal, with a lot of help from my friends, meteorologist Tom Wysmuller, and Prof. Will Happer. Here's the original version, as we submitted it (with references and a graph). April 26, 2018 — Updated with latest PSMSL data. They got caught, which you'd think would end their careers, and land at least some of them in prison. But it really hasn't hurt them much. The Obama-appointed U.S. Attorney protected them by refusing to prosecute until the statute of limitations had run out, and most climate activists don't seem to mind being lied to. March 27, 2017 — A Tutorial On Climate Change. Oakland and San Francisco, California, have have filed lawsuits against oil companies to recover costs associated with adapting to climate change. U.S. District Judge William Alsup, who is presiding over the case, requested that the parties provide tutorials on climate change and the history of climate science. February 14, 2018 — A few decades ago, the focus of most “climate scientists” (who were generally called climatologists, back then), shifted from observations to modeling. These days, all the climate catastrophists' predictions are based on alarming computer models, which, desite 2/3 century of rapidly climbing greenhouse gas emissions and levels, are still largely unconfirmed by measurements. 3½ months after that paper was published, the IPCC was founded, to address that perceived problem—which turns out to have been much ado about very little. January 19, 2018 — I am quite impressed by PragerU's videos on climate change. October 27, 2017 — How did news organizations like WRAL come to believe that it's valid journalism to seek out "experts" at only one extreme of the range of the scientific opinion, for their "documentaries?" That's not news reporting, that's propagandizing. 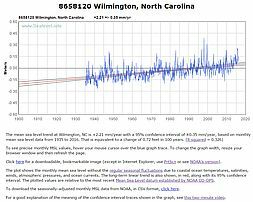 Here's NC's longest, highest-quality sea-level record (Wilmington), plus the WRAL prediction. Sea-level there has been rising at about 2.3 mm/year for the last 82 years. WRAL predicts 11.1 mm/year over the next 83 years = ~5x as fast as the real trend. That's despite the fact that, other than spikes with strong El Ninos, there's been no significant acceleration in sea-level rise, so far. July 29, 2017 — Our Internet service went down yesterday, and it's still down. As of this morning, the server is back up (sort of), limping along on a lower-bandwidth, jury-rigged temporary connection. Please forgive the outage and the sluggish response times. Update: as of July 31, 2017 we're back up on the regular connection. May 23, 2017 — I've made several minor improvements on the site. One is that on the data analysis pages for tide gauges you may now override the default width and height for the graphs. May 21, 2017 — New WUWT article: Climate scientist Josh Willis shows you how to deal with your climate change denying uncle - but fails. March 27, 2017 — I've added an option to plot an extra line segment or curve, typically used to display a forecast of future sea-level rise. The projection can be drawn with either a constant acceleration curve, or a constant slope (linear). For example, here are the linear and constant acceleration graphs showing the wildly unrealistic accelerations required to reach the “three feet by 2060” prediction of some of the crazier climate alarmists for Miami. February 9, 2017 — The Next / Previous buttons on the sea-level analysis pages now do a better job of taking you to a related page (e.g., another site in the same country/coast). January 26, 2017 — Try the new (preliminary) country/coastline code list on the Data page. January 21, 2017 — Article on WUWT about this site: New website gives you the real deal on sea level rise and rates (or here). January 5, 2017 — First release of interactive sea-level analysis and visualization tools. There are currently 1269 tide-station locations in the database, with sea-level data. There are still a few rough edges, and a hefty to-do list; your feedback is valued! December 25, 2016 — Merry Christmas! For your holiday enjoyment, here are five facts about climate change, which I posted on Quora. Here's an earlier Quora screed, about what it means to be a “skeptic” about global warming. October 3 - November 27, 2016 — Here's a preview of upcoming sea-level visualization tools at SeaLevel.info. These are graphs of sea-level at Honolulu, Hawaii, Wilmington, North Carolina, Chuuk Atoll, Micronesia, Brest, France and many other locations, with many interactive features and options. Options are provided to choose the data source (NOAA vs. PSMSL, though not yet for all locations), to choose whether to display the linear trend (calculated from all available data, rather than recalculated every few years, as NOAA does) and/or quadratic trend (for detecting acceleration/deceleration), and to choose whether to display confidence intervals, prediction intervals, and CO2 level. Additionally, you can optionally constrain the range of dates shown or analyzed, smooth the data in various ways, and adjust various display options, such as colors and line thickness. April 6, 2016 — Sea-level is not rising everywhere. The measured rate of coastal sea-level change varies from -17.59 mm/yr at Skagway, Alaska to +9.39 mm/yr at Kushiro, Japan. The average, as measured by the world's best long-term coastal tide gauges, is just under +1.5 mm/yr. That rate has not increased (“accelerated”) in over 85 years. March 28, 2016 - Ooops! Alarm over sinking islands premature as sea level falls at Kwajalein Atoll. February 3, 2016 — New "Feedbacks" page added. Everything You Always Wanted to Know About Climate Feedbacks* (*But Were Afraid to Ask). It's still a bit rough around the edges. As always, I would be grateful for your feedback comments & corrections. December 14, 2015 — Good essay today in USA Today by Rep. Lamar Smith (R-TX), chairman of the U.S. House Science, Space and Technology Committee. December 8, 2015 — The Resources page of this site got a long-overdue reorganization. Suggestions for further improvement are very welcome. October 16, 2015 — Environmentalist David Siegel shares What I Learned about Climate Change. He learned a lot, and so can you. May 12, 2015 — Australia's Joanne Nova reports on The scandal of sea levels — rising trends, acceleration — largely created by adjustments. May 5, 2015 — Here are Dave Burton's remarks at the North Carolina Coastal Resources Commission meeting in Manteo, NC, on April 29, 2015. It's part of the latest chapter in North Carolina's simmering kerfuffle over sea-level rise. Notes: In 2012 NOAA recalculated sea-level trends for those 42 U.S. tide gauges using data through 2011. The results were illuminating. The sea-level records for the 42 gauges had an average duration of 87.4 years (through 2011), and NOAA's calculated trends had an average confidence interval of ±0.515 mm/yr. When new (through 2011) trends were compared to the old (through 2006) trends, 23 sites showed slight declines in the rate of sea-level rise, and 19 showed slight increases. A simple, unweighted average of the 42 gauges comes to 2.025 mm/yr average rate of SLR through 2006, or 2.026 mm/yr through 2011 (a difference of one one-thousandth of a millimeter/year), or 1.286 mm/yr if you include Peltier's VM2 GIA adjustments. The bottom line is that, as measured by the 42 best U.S. long-term trend tide stations, the average rate of sea-level rise over the 5-year period from 2006-2011 is virtually identical to the rate for the full data record (averaging 87.4 years duration) -- more proof that there's been no detectable acceleration in rate of sea-level rise in response to elevated CO2 levels. March 8, 2013 — updated spreadsheets with latest NOAA and PSMSL data. March 1, 2013 — Rev 0.6, most of the spreadsheets here now have clickable column headers. Click a column header to sort the data by that column. Click again to reverse the sort order.